From Olympic Gold - to Setting the Gold Standard in Children’s Programs! How a record breaking athlete applied his skills to building a global NGO. Johann Olav Koss, four-time Olympic Gold Medalist and ten-time world record holder founded Right to Play in 2000. Since that time the organization has grown to approximately 650 staff, 15,000 volunteer coaches and 300+ professional and Olympic athlete ambassadors, that have all had a hand in transforming the lives of over one million children in over 20 countries. From his headquarters in Canada, Johann has provided leadership and inspiration to his management teams in the USA, Norway, the Netherlands, Switzerland, and the UK as well as working tirelessly in raising awareness and funds on a global scale. Johann has been equally recognized for his athletic and his philanthropic achievements – from being named Sportsman of the year by Sports Illustrated and receiving the International Athletic Association Award, to being recognized as Young Global Leader by World Economic Forum and One of 100 Future Leaders of Tomorrow by Time Magazine - as well as most recently being appointed to the Order of Canada. Johann was very gracious in giving some of his time to chat with Sylvia MacArthur (IRC Canada) about how he applied his skills in building Right to Play. Sylvia: Let’s talk first a little about your personal journey and how you ended up doing what you do. You could have parlayed your amazing Olympic success into a media career and doing endorsements, you studied medicine and yet decided not to practice. What led you to this path – of establishing a global NFP/NGO? Johann Koss: I have many interests, I have a passion for sports – not just skating, but all sports – sports are very much a part of my life still. I love medicine, I come from a family of doctors, my mother and father are both medical doctors, so it was something that I really wanted to do, and I fully intended to practice. I have a real passion for children and wanted to improve their lives. With my early exposure to children in challenging environments through Olympic Aid I saw how much there was that needed to be done and that became my focus in life. Sylvia: Your first coach said that you did not have a natural talent for skating but rather that you had a deep commitment to training. You were very young at the time. What do you think it is about your personal makeup that allowed you to find this focus so early in life? Johann Koss: Perhaps it was part of my upbringing but I always was very focused on the things that I was interested in. I was never one to be so interested in partying and just fooling around. My interests were more in sports and academic areas. I tried a lot of sports and when I found skating it was something that I loved and that I just wanted to become very good at. I was determined to improve day by day and worked hard at it. I think that I set myself realistic goals by improving my skills step by step. I did not know or dream that I would reach the level that I did at the time, but focused more on constantly getting better at the sport. I think that this is something that you should do in anything that interests you or that you take on. Don’t set yourself unrealistic or overwhelming goals but instead focus on constantly improving and you will get there. Sylvia: There are athletes that perhaps had more natural talent that did not achieve anything close to what you’ve achieved. What are the key qualities you feel contributed most to your success in sports? Which do you feel you are using most in your business life? Johann Koss: I think that many of the same principles apply to making a success in sports and in business You have to have passion and enjoy what you do and always look to improve things and take them to the next level. I learned that through sports – if you apply yourself and work at it, success will come. I think the same applies to business – you always need to be working to improve things and constantly building – one success at a time. Sylvia: Many elite athletes start charities or lend their names to charities but few have been able to build something on a global scale, as you have with Right to Play. To what do you attribute this amazing success and what do you think you did differently to achieve it? Johann Koss: It was not easy. Initially there was a lot of skepticism because people did not understand the value of sports and play and the positive impact that it could have on the lives of children. There was little understanding of the value of using play to teach children. Play was seen as being frivolous and the value of it was not taken seriously. We had to overcome that by demonstrating how play could transform education and by connecting play to educational outcomes. Once we were able to show how play and sports could be woven into lessons, and how learning improved as a result, we were able to get the traction we needed and the program started to gain momentum. I think I approached this in much the same way as I approached my training – working hard day after day in getting this message out and in the end the success was beyond what I expected. It took a lot of commitment and perseverance on the part of the coaches and staff to build that message and to realize the kinds of results that we have seen. It required never giving up – even when there was skepticism and the going was tough. That’s what allowed us to get to where we are today. Sylvia: Not all elite athletes go on to become successful leaders in other ventures. What skills and attributes that you developed as an athlete do you feel most contributed to your success in becoming the CEO of a global organization? Johann Koss: I learned a lot from sports. I learned that in order to do something well you had to have motivation, to have passion, you had to set your sights on a goal, you had to be prepared to work hard at it, you had to use failures and adversity as learning to improve, rather than cause to give up, and you had to build a strong support system and team around you. It is really no different in business. You have to have the same passion, surround yourself with strong and good people and be relentless in working towards your goal. Sylvia: You got into this business through Olympic Aid and subsequently leading that organization. Their focus was as a fundraising organization to help war torn countries and you could have continued this same model. How did you come to realize that you could make a longer lasting impact through the power of sports and play? Johann Koss: Olympic Aid was a great organization that did many good and vital works. It was similar to the work being done by many other organizations. Through the work that I did with Olympic Aid I travelled into areas that were ravaged by war and poverty and saw the devastating impact that this had, especially on the children. I saw how they had been robbed of their childhoods and their humanity. I saw how joyless they were and how they had no hope. Having had the privilege of being involved in sports, knowing what I learned from sports and playing, and the confidence it had given me, I wanted to bring that to these disadvantaged children. I believed strongly that you could learn life lessons and life skills through sport and play and that play could give these children their humanity back and ultimately, transform their lives. Sylvia: What were the biggest obstacles that you had to overcome to establish Right to Play and how did you go about overcoming them? Johann Koss: Once we had broken down the initial skepticism, the biggest challenge was in getting funding and building scale so that we could bring the program to as many children as possible. We also had to get the communities involved so that we could build something that was not just a onetime exercise but something that was a constant and consistent program and sustainable for the long term. Community involvement was really critical and, because we had limited funding, we had to engage and inspire people in the community to give their time to become role models and coaches for the children. We have been incredibly fortunate in that so many people were committed to improving their communities and willing to support the program by becoming coaches. This is particularly outstanding because the coaches were living in the same unfortunate circumstances and have now become leaders in their communities. Sylvia: There are of course athletes that found later success in business but with all of the research that I’ve done, I could not find anyone that has been as selfless and committed as you have been, dedicating all these years to Right to Play. What keeps you so motivated? 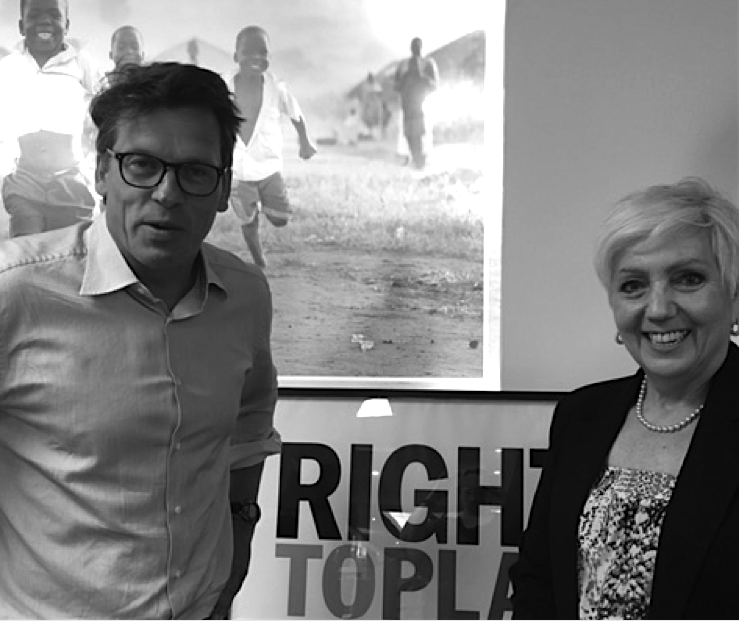 Johann Koss: It is really not hard to stay motivated when you see results and the impact that the Right to Play program has had on so many children and communities around the world. When you see girls in Pakistan, who had no rights, and had always been excluded, playing for the first time. When you see thousands of girls gaining control over their lives through Aids education and gaining the confidence to say no. When you see children that had been living in anarchy all of their lives play with others in structured games where they are developing friendships and a sense of community. When you see children in refugee camps who have lost everything regain their sense of self and hope through play. When you see thousands of children actually completing school and enjoying learning. When you see the impact the program is having on so many of these little beings, you can’t help but stay motivated. Sylvia: I watched multiple videos of your athletic successes, Right to Play, and of you as founder and ambassador of the organization. While your Olympic videos still get hundreds of views, even now more than 10 years later, videos of Right to Play and you speaking about the organization get thousands upon thousands of views – in league with much bigger and longer established NFP/NGO’s. What do you feel is the biggest reason for Right to Play to be attracting such a high level of interest? Johann Koss: I think that people have come to realize that play has a purpose and that children are learning through play – that play can change behaviour and teach critical life skills. I think that it has captured people’s imagination and that they are seeing the learning and the joy that children, in the very worst of situations, are enjoying through play based activities. They are seeing the hope and the future in the eyes of these children. Sylvia: Right to Play has also been very successful in attracting high profile donors/sponsors and partners – ones that pretty well every NFP/NGO solicits for support. What do you believe are the most compelling reasons why these companies support Right to Play rather than perhaps some other NFP? Johann Koss: We have been very lucky in getting support from some large sponsors on a global level but even more so on a local level. The bulk of our sponsors are local with many, many companies thankfully having invested in Right to Play. Sponsors know that we help children learn using play as a catalyst for developing physical, cognitive and social skills. We promote health by encouraging physical fitness and by educating children about national health issues like HIV/AIDS, malaria and immunization. We build peace by teaching conflict resolution skills and helping children and communities affected by war. We build communities by working with local staff and volunteers and working with local organizations to help build infrastructure. Our sponsors have seen the results within their own countries and communities and are committed to supporting this effort. As our programs are all aimed at improving learning, building confidence and community in children, this is really about building a better future. Sylvia: You are obviously a passionate, driven and focused individual. Do you look for similar traits in the people you surround yourself with? What qualities do you look for in the staff, volunteer coaches and athlete ambassadors you bring into Right to Play? Have you found any consistent factors that lead to success in these roles within your organization? Johann Koss: I would not have realized the success that I did in sports if it had not been for the people that supported me – my parents, my grandmother, my coaches and many others. That is the same with the people that are behind the success of Right to Play. We had to build local capacity and find people that are passionate and believe they can make a difference. You absolutely have to have a love for what you are doing and a strong commitment to improving the lives of children to do this work. This is most important because we do not have the funds to pay staff well and our thousands of coaches are working on a volunteer basis. You have to be able to stay focused and positive, and to work through setbacks and tough situations without being defeated. You have to get your rewards from seeing the positive results of your efforts – the physical, psychological and social skills that these children have learned because of your efforts. We have been really fortunate to find these traits in so many people that support our communities. Sylvia: In a 2010 interview you said that your 10 year plan was to make Right to Play sustainable and to have governments and global organizations like the United Nations, develop policies, making the right to play a fundamental part of their development plans. We’re 7 years into that plan now. Do you feel that you are on track of reaching that goal? What do you feel needs to be done in the next 3 years to ensure that this goal is reached? Johann Koss: We are very much on track. We have been working with local governments and global advocacy groups to get the program integrated into policy, to get it to become part of a regular curriculum. We have 10 such defined programs in place now and will continue to build from there. This is very critical to us as, by getting it into policy and onto a regular curriculum, the program becomes truly sustainable. We’ll keep pushing ahead to making Right to Play more mainstream. Funding continues to be a real challenge and we are continuously working on that as well as expanding and evolving the program. We continue to be focused on building and reaching more and more children through quality education, teaching life skills, promoting health and gender equality and building peaceful communities. Sylvia: You have, and continue to sit on several Boards for a range of businesses that have little connection to your athletic success or the success of Right to Play. 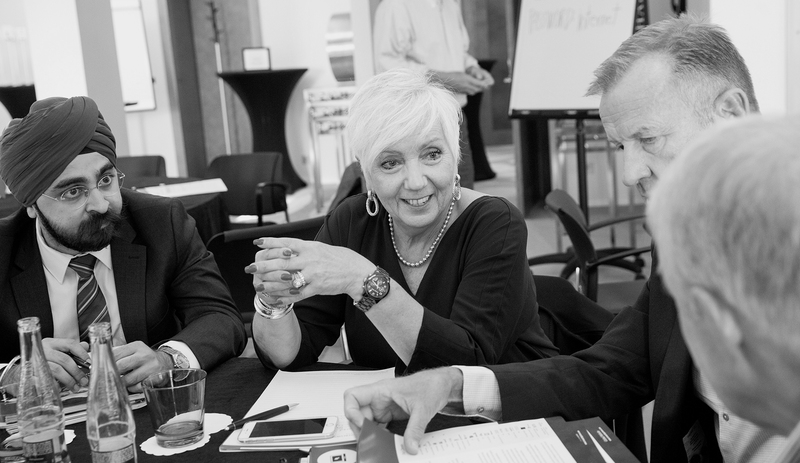 What role do you generally play in these Board appointments and how do you leverage your world experience to these appointments? Johann Koss: Through getting my MBA I have further strengthened my marketing and financial skills and I bring these to my Board work. I also bring strong global perspective and practical and strong business skills. I think that running a non profit business is much more challenging in many ways than running a commercial business. A non profit is much more closely scrutinized and needs to be very tightly managed as operating costs cannot exceed 10%. There are not many enterprises that operate on a 10% budget. You have to be very resourceful and creative to get things done with that kind of tight budget. I think that benefits the Boards that I sit on. Sylvia: What does the future hold both for Right to Play and for you personally? Johann Koss: I recently stepped down from being the CEO and we were very fortunate in bringing in Kevin Frey to take over as CEO. He is a very accomplished guy that will be able to take Right to Play forward. His leadership will help drive our future growth. I felt that it was time for me to recharge and not be as operationally involved. I will continue to be very involved but with a primary focus on innovation and continuing to raise awareness and funds.